After 24 years of waiting, at 11.37 Rome time Philadelphia's own John Cardinal Foley received the red hat and, as reported here the other day, the deaconry of St Sebastian on the Palatine Hill. Blessed be God... and John Cardinal Krol. And congrats, H-Town -- he didn't want to know his titular church until the Pope told him... and so, as Daniel Cardinal DiNardo received his biretta (right) and "bull" -- the formal document of his creation -- he learned that the church of Sant'Eusebio on the Equiline Hill would be his. The gift of the 4th century church -- one of the oldest in Rome -- to the South's first-ever ecclesiastical prince is a loud sign of the love and esteem with which his former colleagues in the Curia have long held DiNardo, who served on the staff of the Congregation for Bishops from 1984-90. Named for the early-church bishop of Vercelli, Sant'Eusebio's last cardinal-priest was Vienna's legendary Franz König, who died aged 98 in 2004. 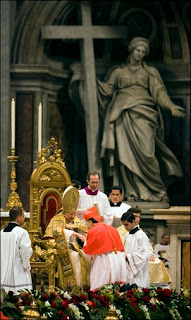 König was given the church at his creation in 1958, when he received the now-bygone galero with thirty tassels from Bl. John XXIII. Among other notables, Rome's French national church of S. Luigi dei Francesi was given to Cardinal Andre Vingt-Trois of Paris, the Argentinian parish of S. Maria Addolorata on Piazza Buenos Aires went to the Argentinian Cardinal Esteban Karlic, the retired archbishop of Paraná, and Cardinal Sean Brady of Armagh received the long-dormant title of Ss. Quirico and Giulitta. However, only three of the new intake will take possession of their churches in the days to come with the traditional Mass and visit. 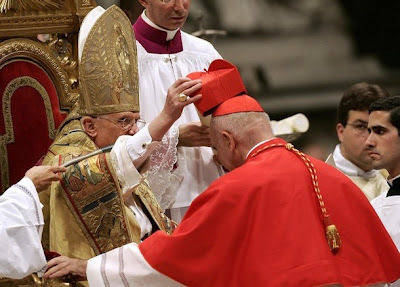 On approaching the throne for his red hat, the last of the group -- Cardinal Umberto Betti OFM, the former rector of the Pontifical Lateran University -- wept before the Pope. Unable to kneel for the conferral of his biretta, the 85 year-old Franciscan declined episcopal ordination after his elevation was announced. And as a reflection of its solidarity with the nation he yesterday referred to as "tortured," Iraq's first-ever cardinal, Patriarch Emmanuel III Delly, received a rapturous ovation from the capacity crowd as B16 presented him (above) with a stylized red hat, in keeping with the garb proper to the Chaldean Catholic church. Delly to Iraqis: "Come Home"